It rained all morning! My wife was going to meet other women from our Life Group at church to see a chick flick so I invited all the husbands to go flying with me. I called one of my buddies at 12:30 and it was still raining too hard. I said I would call him back at 1:30 and make a definitive decision as to whether I was going to fly or not. I had worked on the retracts on my Bridi Dirty Birdie and really wanted to get it in the air. Plus I REALLY wanted to fly my Ultra Stick again. 1:30 and the sky was much lighter and the rain had stopped. I called Ray and told him we were on. 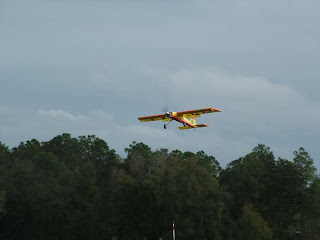 I got to Tangerine field and the only guy there was Al Taylor who came down from Chicago to fly at Florida Jets next weekend. He brought a sweet little Kyosho Little Kelly pylon racer. Beautiful airplane and boy was it fast! This is the first time I've flown at Tangerine Field without a strong crosswind. The wind was almost straight out of the north, only a couple degrees off running right down the runway. Let me tell you, I had a blast flying today. I would take the Ultra Stick and do Harriers down the runway, without flaps and with flaps and even with the crow. It is amazing how well this plane flies! I was bringing the plane in low, at the speed of a fast walk without touching the ground. The takeoff distance with full flaps was about six feet! I can take off even in a shorter distance but my engine was cutting out a little when I poured the coals to it! Another guy named Todd along with his dad Larry and a buddy Tim showed up with a little 40 sized Stinson Reliant. He hadn't flown in a couple of years and wanted to know if I would help him out by taking the plane off and flying it for him. The plane did not have a steerable tail wheel but I got it off and it was a little tail heavy and it had way too much elevator. We were able to reduce the throw on the elevator and Al had a couple ounces of lead we put on the nose. The plane flew a little better as long as you kept it under half throttle. Todd took it off and landed it. He did a great job. With a little more weight in the nose it will be a good plane. I got the Dirty Birdie off the ground but it had WAY too much up elevator. I couldn't trim it out so I brought it in and changed the sub trim and that helped but then the steering came loose on the nosewheel so I put it up, will work on it later. I have the center of gravity just right on the plane. It landed very nicely for a pattern plane. I also had to adjust the idle and got it dialed in just right! I'll have photos of it soon. If you want a plane that is a pure joy to fly, I would highly recommend the Ultra Stick 60! Now I need a couple days in bed to get my back in order. I just can't go out and fly like I used to! 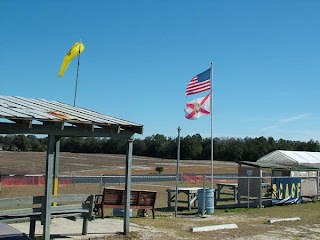 On Friday, February 26, 2010 I went to Tangerine Field to fly my Ultra Stick 60. As always, there was a pretty stiff crosswind. I asked one of the other guys that has been flying there for awhile if the wind ever blows straight down the runway. He told me it is almost always a crosswind. That really is no big deal if you know how to "fly the rudder". 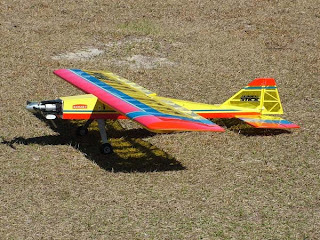 It is a little harder with an airplane like the Ultra Stick 60 though. Due to it's light weight, the wind really blows it around. A heavier airplane will handle the wind much better. I have never had an airplane that was light enough to do what we call 3D flying. This Ultra Stick seemed promising to do some 3D maneuvers but I hadn't had a chance to try any yet. I've done 3D maneuvers on the flight simulator. 3D flying is pretty incredible. 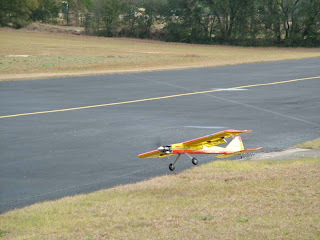 One of the things pilots of radio controlled airplanes can do in 3D is to "hover" their airplane. It is just like how a helicopter hovers. While the airplane is flying, the pilot will slow the airplane and keep putting the nose up until the airplane is vertical. Using the throttle, he will "hang" the airplane on the propeller. It is quite exciting to see it. It is not an easy maneuver to do though. The airplane is NOT stable when you are doing this and you have your hands full to keep the airplane vertical. The engine's torque will actually turn the airplane in what is called a "torque roll". Another maneuver is a "Harrier". In the Harrier, the airplane is flown very, very slowly keeping the nose high and the power up on the engine to keep airflow over the wings. Again, this is another impressive maneuver. It is recommended to use a .61 to a .90 cubic inch 2 cycle engine on the Ultra Stick 60. I originally put my Fox .74 on the plane. Fox's engines are incredibly powerful. I could not get the engine to run for any length of time however. The engine acted like it was having trouble getting fuel so I took the fuel tank out and replaced all of the tubing in and out of the tank. That still didn't do any good. Obviously there is something wrong with the carburetor on the Fox. I have ordered a new one and will put that engine on my new design that I am calling the JayMc Extreme Kaos. I had originally planned on putting my O.S. .61 engine in the Extreme Kaos but decided to go ahead and put it on the Ultra Stick. 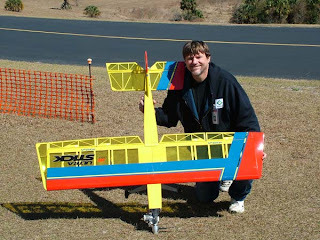 I have always used, at least, the largest recommended engine size on any RC plane I've flown. You can always cut your throttle back if you have too much power but you cannot add power that an engine does not have. With the .61, I wasn't sure if there would be enough power to "hover" the Ultra Stick. 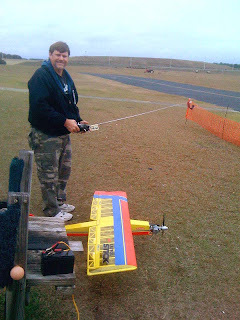 I got to the field and did a quick charge on my batteries, fueled the plane up and took off. I flew around for awhile to acquaint myself better with the flying characteristics of this plane. This was only probably my seventh flight. With a lot of altitude, then, I slowed the airplane and pitched the nose vertically. I begin to add power as it was needed and the airplane hovered!!! I was really excited. 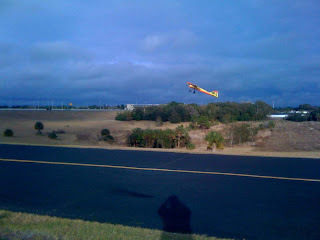 With the elevator and ailerons on high rate it hovered nicely but the wind kept blowing the airplane east! I hovered the airplane a few times and then did a Harrier with the flaps down and the ailerons in the "crow" position. This airplane is a blast to fly! 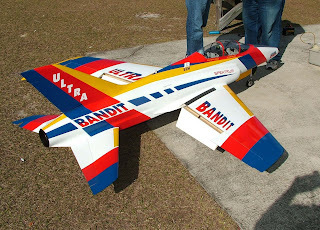 One of the things that the manufacturer of this plane says you can do is to make a vertical dive with the wing in the "crow" position and then land in just a few feet. I gained a lot of altitude and put the wing in the crow position and pointed the nose straight down. It is amazing how the flaps and ailerons, deflected to their full extents, will keep the airplane from gaining excessive speed in a dive. They act just like dive brakes. So far, every time I've flown the plane, I've discovered something new that it will do. This is a FUN airplane! 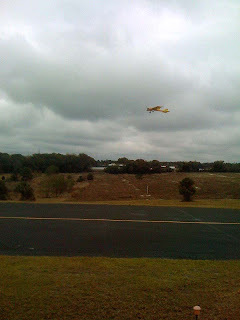 I was at Tangerine Field, the Radio Control Association of Central Florida's model airport on Friday February 18, 2010. I got some great flights on my Hangar 9 Ultra Stick 60. The day before, there were some tough crosswinds but the wind was great this day! 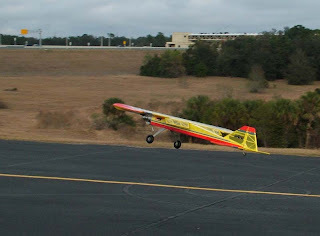 The Ultra Stick really got blown around by the crosswind and I really had to "fly the rudder" to keep the nose straight down the runway on landing. Thursday was different! There was almost no wind and I made some beautiful landings. The low wing loading on the Ultra Stick makes for some really slow landings. I haven't used the "crow" setup yet but I understand that the airplane will fly in the "Harrier" position at walking speed. Once I get a little more comfortable with the way the plane flies, I'll do a little more with it. 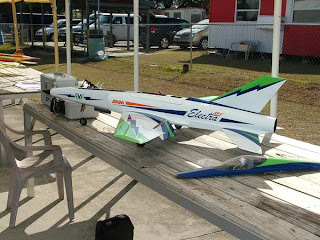 I have been flying model airplanes for almost 40 years and I've never seen a real turbine powered RC plane fly! I've seen ducted fans but not jets. There was fellow there that was trying to fix a fuel leak on his $24,000 jet and he told me that Bob Violett was coming out. I have read about Bob Violett for years. 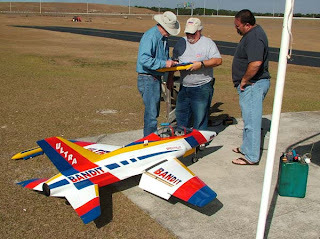 He makes some of the finest RC jets that are available. Click Here to go to his website. Bob and his entourage showed up but I finally had to leave before I got to see any of his jets fly. I am really looking forward to seeing them go! As I turned into my subdivision, I saw one of our retention ponds and it was as smooth as glass. I decided to take my float plane over to Float Plane Lake #3 for a couple of flights. I hooked up my fast charger and let it peak the batteries on the plane and the transmitter on the five minute drive to the lake. In no time at all, I was in the air. The engine was running a little rich so I landed and leaned the engine out and went back up. Just as I got about twenty feet in the air, the engine sputtered and died. I was able to get the plane back on the water in the northeastern corner of the lake. I tried to taxi it to the shore but it was about 10 feet away. I really didn't want to go swimming so I decided to wait for some wind to blow the plane to the shore. Well, after at least an hour and a half, the plane finally floated to the southwestern shore of the lake. It is always a good idea when flying a float plane with a glow engine to make sure there is a little wind and that your lake/pond is not too big unless you have a boat or are willing to swim! 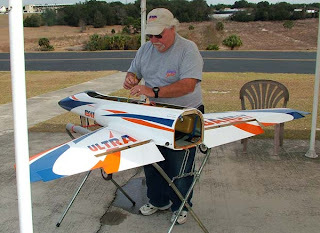 I got my 60 sized Ultra Stick ready to fly and took it to Tangerine Field for the test flights. Yesterday, the wind was gusting up to about 30 miles per hour and it died down some today. The wind was gusting up to about 15 or 20 mph today. 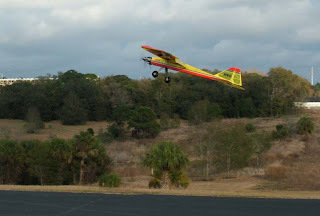 I don't always mind flying in the wind but the Ultra Stick is a very light airplane which makes some difference. 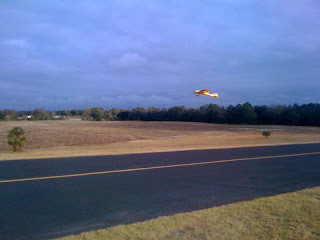 I have never seen the wind blow straight down the runway at Tangerine Field and today was no different. There was a 90 degree crosswind. But, before I go there, let me back up and tell you about the Ultra Stick 60. First of all, the Ultra Stick is designed for .60 to .90 sized engines. I originally put my Fox .74 on the airplane but no matter how I tried, I could not get the engine to continue to run. I almost burned up my starter. Finally, I put my trusty O.S. .61 FX in the plane. O.S. engines are the cream of the crop. Yes, you will pay more money for one but the reliability just can't be beat. I had to add about a half a pound of weight to the tail of the Ultra Stick to get it to balance. I HATE having to add weight to airplanes but they have to balance! The elevator and rudder use plastic housings with wire pushrods. When I put the wire in, it would barely move. It was bound up so badly that there is no way the airplane could be flown that way. So, I made pushrods the old fashioned way with wooden dowels. After ripping the plastic housings out of the airplane and then cutting larger exit holes for the pushrods, I had them in. That took me a couple of hours extra. 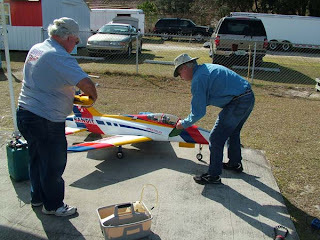 I wasn't too happy but this is what happens when you buy ARF (Almost Ready to Fly) airplanes. I called Hangar 9 and they said they had never heard of that problem before and they would send me out a couple of new pushrods. LOL, a lot of good that does. Maybe I can use them on a differenc airplane. Once I had the OS engine in the plane, I loaded it up in my Olds Alero. It was a tight squeeze but I got it in there and I was off to the field. 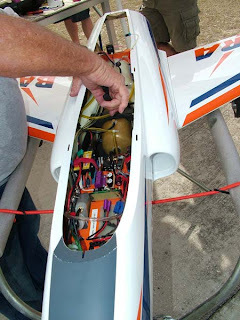 Once at the field, I had to make a small adjustment on the throttle pushrod, then I was ready to fly. The plane took off without any problems. The .61 proved to be plenty of power for the airplane. I almost always use the largest engine recommended for an airplane but this airplane comes in at right around 6 pounds and the .61 was plenty of power. I flew it around a little bit and got it trimmed out and then decided to come in for a landing. As light as the plane is, I really had to "fly the rudder" on landing. The airplane wanted to come in absolutely sideways. The plane landed very slowly with some rudder input. I took the plane off again and tried a roll and then, with a lot of altitude, put in full flaps. the nose pitched up high. I will need to set the radio to compensate with some down elevator when the flaps are activated. I set the wing up on the Ultra Stick to "crow". Crow is where the flaps go down and the ailerons go up. The airplane is supposed to fly very slow in this configuration. As I get a little more familiar with the plane, I'll try the crow out. I landed the plane again with a lot of rudder input and was very happy with the very slow landing. I sat down for awhile and when I got ready to take off again. The engine was making a LOT of noise at idle. I knew something was loose so I shut the engine off and found that the firewall was not glued into the airplane very well. This is a typical problem with ARF's that I have found. I had a Goldberg Skylark 56 ARF that after one flight the nose wheel came unbolted and I had to cut a huge hole in the bottom of the fuselage to fix it. My floatplane, a Tower Hobbies .60 sized trainer was held together by the covering material. I think someone forgot to glue the fuselage together! I brought the Ultra Stick home after finding the firewall loose. I'll have it glued up tonight and hopefully the wind will die down tomorrow. Overall, the Ultra Stick seems to be a pretty nice plane although it falls into the same category as all of the other ARF's I've had, bad gluing and not very good quality control. The price seems a little high to me and it is a large airplane for a .60 sized airplane. For those of you, like me, that are trying to stuff this plane into a small car, you may want to opt for the .40 sized plane. 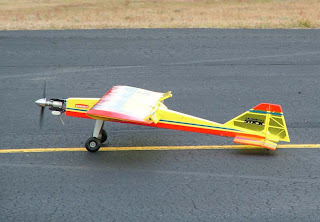 Pitch is the same on model airplanes as it is on real airplanes. Pitch is how many inches the prop will move in one revolution. So a propeller with an 7 inch pitch will move 7 inches in one revolution. Lower pitches are better for climbing and power maneuvers. Higher pitch props are better for speed. The fewer blades a propeller has, the more efficient it is. Ideally, the perfect propeller would have one blade but balance would be a major problem. So, a two bladed prop is more efficient than a three bladed prop.